The eight day Scotland tour we have detailed is purely to assist in giving you some idea of what can be achieved. We appreciate there are many factors in deciding how long a trip should be and we will work with you to ensure you make the most of the time you have available. Whether you wish to concentrate on a specific area or take in a grand tour of Britain we can custom build an itinerary for you. Your Driver / Guide will meet you in the terminal building of Glasgow Airport (a name card will be displayed). What you do today will to depend on how you feel after your journey. However it might be worth a look round the City of Glasgow before we head North. Though much bigger than our Capital City of Edinburgh, Glasgow has always had a more earthy, industrial image. Whilst that came about with good reason it has also hidden the fact that Glasgow has some magnificent architecture. Equally it can boast amazing galleries, and museums. After a look round the city centre areas, we may head across to Pollock Park where the Burrell Collection (gifted to the City by wealthy shipping agent Sir William Burrell) is housed in a purpose built museum. Charles Rennie McKintosh was a famous son of Glasgow, and in the early 1900s one of the nations leading figures in architecture and design. We should take time to experience some of his work first hand. Shortly after leaving the City boundary we begin to travel along the shore of Loch Lomond. As we drive along the entire length of the Loch you quickly realise why these “bonnie bonnie banks” have been immortalised in song, and equally find out the true meaning of “taking the high road”. Further on we pass Loch Awe, and Ben Cruachan (the hollow mountain). We will learn more about that during the next couple of days. We will be spending the next couple of nights in the Oban area where there are a number of excellent accommodation ideas including the magnificent Isle of Eriska Hotel. From your hotel we travel the short distance to the Harbour town of Oban. This is one of the main ferry terminals to the Westerns Isles, and as such it is a vibrant little town. After a look around we take the winding route South out of Oban, and start down the coast. We will perhaps have fewer visits today, and concentrate more on the scenery (albeit we will stop of at Kilmartin Museum in the middle of an area which is full of ancient stone circles). 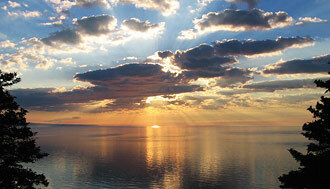 Upon reaching the Mull of Kintyre you will surely start to see why. You may recall that a famous “Beatle” has a home here, and was inspired to write the enormous hit record, simply called “Mull of Kintyre”. Hopefully we can reach all the way down to Campbeltown before returning, partly by the same route. However at Lochgilphead we may well continue by Loch Fyne on to Inveraray. This is in itself a remarkable little town that was laid out about 250 years ago by an ancestor of the current Duke of Argyll whose family lives in nearby Inveraray Castle. The original town was perhaps a little close to the castle for the then Dukes liking. Among the buildings is a hotel, which our great poet Robert Burns stayed in some time in the latter part of the 18th Century. He could not have enjoyed his stay since he was inspired to write the following verse; “There’s nothing here but Highland pride, and Highland hurt, and hunger. If providence hath sent me here it must have been in anger”. It is still a hotel to this day, though I doubt if anyone would now wish to make such a comment. On now past Loch Awe, and back to your Oban area hotel. An alternative to this trip could be a day visit to the Isles of Mull, and Iona. We would catch the ferry from Oban. You will have discovered by now that Ben Cruachan is a mountain, which houses a Hydro Electric Power Station. It was an amazing feat of engineering, and a place that is well worth a visit. Further North we come to Glencoe. The craggy mountain’s surrounding this glen (valley) give an impression of great height that can be quite deceiving. This very dramatic atmosphere is added to when you learn about the “Massacre of Glencoe”. This took place in 1692, and started the long running feud between the Macdonald’s, and the Campbell’s (boy, can we Scots hold a grudge ! ), but more about that on the day ! 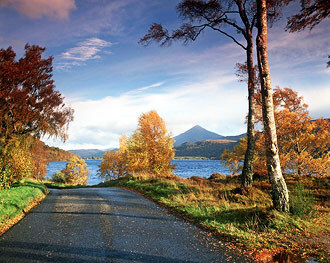 We travel on now, through Fort William and Fort Augustus, to the shores of Loch Ness. Even without our famous monster this is a really beautiful area. Whilst I may not necessarily recommend that you visit the “Monster Exhibition” I would suggest a stop off at the dramatic ruins of Urquhart Castle. What is left of this once great castle combined with its location, and rich history makes for a very worthwhile visit. Though to some extent a little of the steam has gone out of our monster story it is still a subject that can stir great interest from time to time. Do you believe in it ? Do I believe in it ? Why or why not ? At the City of Inverness (it was granted city status as part of the millennium celebrations) we will stop off for a look around before moving settling in to your chosen accommodation for the next three nights. One we often recommend is Culloden House – located just a few miles out of town. After leaving the hotel we will set off on a tour of this fascinating area. One of the most important places to visit is Culloden Battlefield. The culture of the Scottish people (particularly Highlanders) and the way it has evolved over the last 250 years really does become easier to understand after this visit to both the site, and visitors centre. In early 2008 the National Trust for Scotland opened a new visitor information centre that has added greatly to the whole experience. Nearby is an ancient stone circle known as Clava Cairns, and here you get a chance to learn (and perhaps speculate) a little more about the people who lived here two to four thousand BC. On now through Strathnairn (Strath = Glen = Valley) to Cawdor Castle. This is without question one of the North's finest castles, built in the 14th Century, and still lived in by the same family to this day. You may remember the Shakespearean connection with Macbeth. Though more will be explained on the day let us just say for the moment that he took considerable poetic license. As for the non-fictional Macbeth, lets just say he got some very bad press ! From here we might travel through the small towns of Nairn (famous for its Golf Courses among other thing), and Forres (it has spectacular town gardens) to the Cathedral City of Elgin. The ruins of a once grand Cathedral tell quite a story about this small City. This is also where you will find one of Scotland’s finest Woollen Mills (Johnston’s). Their Mill Store sells genuine high quality goods, many of which are manufactured on the premises. Heading directly North out of Inverness we cross an area known as the Black Isle (not actually an Island) then follow the coast up to the little town of Dornoch. This is another town, which is dominated by its Cathedral, though I am glad to say that this one is not a ruin. Again this small town is famous for it’s championship golf course. At least that was the main claim to fame until several years ago when “Madonna” had her youngest child christened in the Cathedral, and the following day was married to Guy Ritchie in nearby Skibo Castle. I’m sure the Cathedral, and Golf Course’s “demotion” will be relatively temporary – especially now they have divorced! 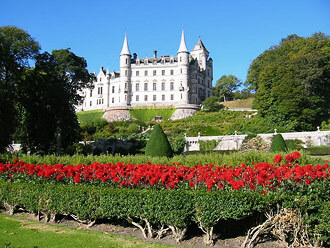 Further up the coast we come to Dunrobin Castle. As you will be aware by now we have a great many wonderful Castles, and buildings. Though it is not practical (or sensible) to visit too many there are some that really justify a visit. Dunrobin falls into that category. The interior, the location, the gardens, are all worth seeing. Hopefully we could also time it for one of the Falconry displays they have throughout the day. This of course was the home of the Dukes of Sutherland. At one time they were among the countries wealthiest families, and certainly the biggest landowners. They became notorious during the highland clearances because of the ruthless tactics employed by their estate manager when “persuading” tenants to leave the land to make way for sheep!! The extent, and consequences, of the clearances are to this day somewhat controversial and it really depends on which of our modern day historians you prefer to believe. That said there is no question that many landowners, law enforcement agencies, and indeed members of the clergy acted in ways that we would now consider morally reprehensible to say the least. It might be worth a look around some of these deserted glens before returning to Inverness. We leave Inverness, and travel East into Strathspey. 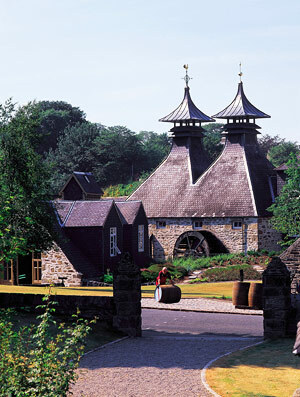 This is Whisky country, and home to many famous brands now sold round the world. A visit to The Macallan, Glenlivit, or Glenfiddich might be an idea, both to see the process, and perhaps enjoy a “wee” sample. After travelling through Speyside (named after the river Spey) we head over the hills, and travel through some very dramatic scenery, to Royal Deeside. The Royal of course is because Queen Victoria (or really her husband Prince Albert) fell in love with this area, and subsequently bought Balmoral Estate. 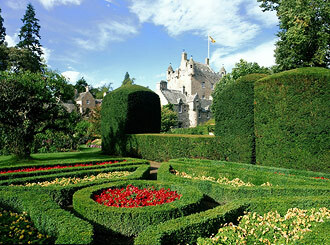 He, and Queen Victoria, built Balmoral Castle, which to this day is the Royal Family’s holiday residence in Scotland. Though a private residence, part of it is open to the public when it is not in use. From here we would travel the short distance to the small town of Ballater. After a look around some of the more interesting stores (including the nearby McEwen Gallery) we will again head into the hills that take us past a winter ski resort before dropping down to Glenshee. At the small town of Dunkeld it is worth taking time to visit the “small houses”. This is a project undertaken by the National Trust for Scotland to preserve a small section of this historic town. They have done a great job, and now rent some of these houses to “sympathetic” tenants. We spend the next two nights in the Perthshire area where one of the best hotel options is Ballathie House. At the start of this day we will probably begin by heading slightly North to Pitlochry (if this is not already the chosen overnight location), and Blair Castle. Though no longer lived in Blair Castle is on the “well worth a visit list”, not just for it’s magnificent interior, but also it’s very rich history. It was home to the late Duke of Atholl, and it is fair to say that many more rooms within this very grand home are open to the public compared to other such castles. We will probably then travel through Aberfeldy, and the “sma glen” to Crieff, and Stirling. This is one of Scotland’s most historic towns and for hundreds of years it was felt that, whoever controlled Stirling, controlled Scotland. William Wallace and Robert the Bruce are two great Scottish figures from the past who were well aware of this. It will therefore come as no surprise that both men are well commemorated in the town, despite the fact that they both lived, and died, in the late 13th and early 14th Century. Of course we must also thank Mel Gibson, and his colleagues for keeping the story alive in more recent times. 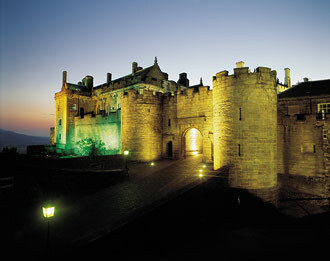 Stirling Castle is now looked after by Historic Scotland (a government agency), and still has a distinct military feel. They are currently in the process of a massive, and lengthy restoration throughout the castle right down to the creation of “new” tapestries, but still using the same old methods. It is fascinating to watch these modern day crafts people at work. Across the town is the magnificent Wallace monument. This is equally worth a visit, not least because you will more readily be able to understand the true William Wallace. Within the last few years a new “small” statue was put up beside the visitors centre. Perhaps you will recognise something in the facial features. The monument also houses a small museum dedicated to great Scotsmen, and on display is the very sword wielded by “Braveheart” himself, Sir William Wallace. It has however been suggested by some cynical people that over the years the handle, and blade have been separately replaced on a number of occasions ?? From here we return to your hotel via the City of Perth. En-route to Edinburgh we will take a slight de-tour to the village of Falkland. This is not just a genuinely charming little village but also the site of Falkland Palace. Though looked after by the National Trust for Scotland this is still in reality a Royal Palace which in it's early years was favoured by Scotland's Stewart monarchs. Here you will see one of the very few Royal Tennis courts left. Yes it is different from the modern day tennis court, and there are still a few people who play this form of the game. All told a very worthwhile visit. From here we travel on to the capital city. Though you will probably spend some time in the city on your own this will be our last day of touring. 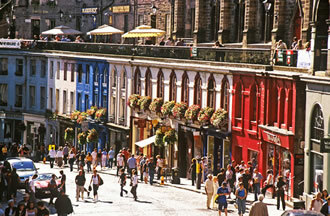 Edinburgh is really best seen by walking, but we will do a highlight city tour upon arrival so that you will have an idea of what is best to see. After taking a look at the old, and the new town it might be a good idea to head down to the dock area at Leith. The Royal Yacht Britannia is now permanently berthed here and open to the public. From the launch of this important vessel in the early part of our current Queens reign till it's recent de-commissioning it was a floating Embassy for the United Kingdom. After checking in to your Edinburgh Hotel you say goodbye to your driver/guide - all good things as they say, must come to an end. But that said your time in this amazing city is only beginning. This itinerary is purely a guide. With a private tour you have the opportunity to discuss this with your driver/guide, and within the basic structure, enjoy a trip that is tailored to your interests.